Are you thinking about deploying iOS Devices in your enterprise but wonder how you will manage, secure, and support them? 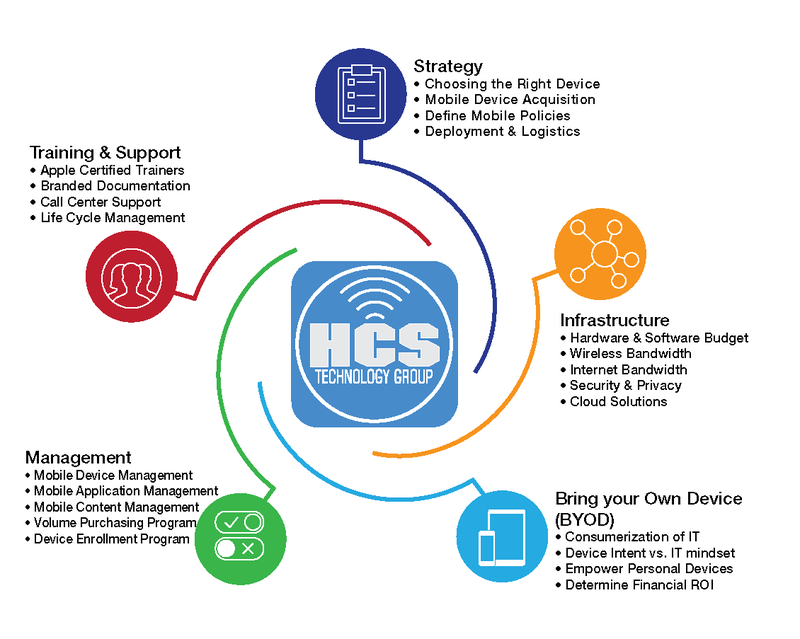 If you are considering the deployment of a large number of iPad, iPhone and/or iPod Touch devices, you want to work with experienced Mobile Technical Coordinators like those found at HCS Technology Group. We can help you decide if you need to join Apple’s iOS Enterprise Developer Program, run a mobile device manager (MDM), or set up provisioning certificates. We can make sure your devices are secured in ways that would surprise you, such as limiting user activities like watching YouTube or using the camera. We can require difficult passwords and help your employees reset them remotely if forgotten, saving them the hassle of bringing the device back to the office. We can also put systems into place that will allow us to remote wipe devices that have been lost or stolen, ensuring the safety of your corporate data. This just scratches the surface of what’s now possible, and we’re proud to be on the cutting edge of these services.